Ian Maule - For Shaw Media Garrett,8, and Hailey Bullamore,11, both of Johnsburg,Il., build snowmen in their front yard Sunday morning ,Decemeber 22,2013, in Johnsburg,Il. McHenry County got between 3-6 inches of snow starting last night and into the morning. Ian Maule - For Shaw Media Hailey Bullamore ,11, sleds down a pile of snow while her father, Brett, both of Johnsburg, Il uses a four wheeler to plow his driveway Sunday morning ,Decemeber 22,2013, in Johnsburg,Il. McHenry County got between 3-6 inches of snow starting last night and into the morning. 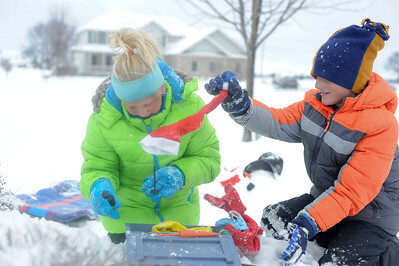 Ian Maule - For Shaw Media Garrett,8, and Hailey Bullamore,11, both of Johnsburg,Il., look through a box of supplies while building snowmen Sunday morning ,Decemeber 22,2013, in Johnsburg,Il. McHenry County got between 3-6 inches of snow starting last night and into the morning. Ian Maule - For Shaw Media Brett Bullamore, of Johnsburg, Il, uses a four wheeler to plow his driveway Sunday morning ,Decemeber 22,2013, in Johnsburg,Il. McHenry County got between 3-6 inches of snow starting last night and into the morning. 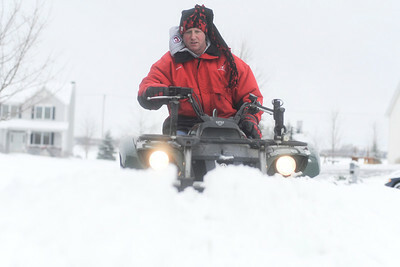 Brett Bullamore, of Johnsburg, Il, uses a four wheeler to plow his driveway Sunday morning ,Decemeber 22,2013, in Johnsburg,Il. 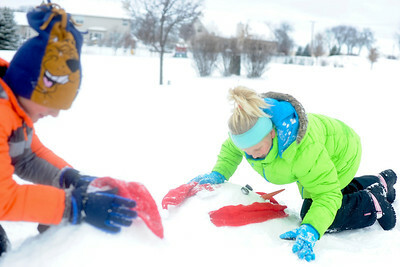 McHenry County got between 3-6 inches of snow starting last night and into the morning.